3 Weeks Ago (7:39 PM). I know this Gen has received a lot of hate in general, some of it deserved and some, maybe not. I would mostly like to know other peoples' thoughts on the introduction of the Rotom Pokedex, and its usefulness. I personally did not understand it at first, and thought it had no real added value to the game. If anything, it annoyed me...why does the pokedex have to talk to me every few minutes? And to tell the player exactly where to go really plays into the hand-holding complaints a lot of people have. Also, the way it speaks is very childish. I have seen arguments that it is a game that is designed for kids, and I understand that, but at the same time I think it ignores those of us (and there are a lot) who have been playing pokemon since childhood and continue with it into adulthood. For example, Rotom randomly asked me if I ever wanted to be an adult sooner. My first reaction was to laugh, because I am an adult. But the whole exchange was a little irritating. On the plus side, I can see the advantage to having the map always be visible. The Roto powers can be useful, but some of them, like HP restore, seem pointless when potions already exist. I would say that although I really disliked it at first, Rotom Dex has grown on me the more Ive played the game. Still, it gets on my nerves at times. I havent seen any threads or comments about it, so what about everyone else? Is it a love/hate thing? 3 Weeks Ago (8:54 AM). 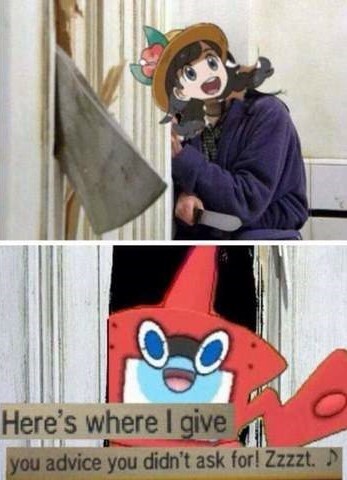 Hate it, Rotom-dex needs to be dropped into the fiery pits of pergatory. 3 Weeks Ago (12:36 PM). 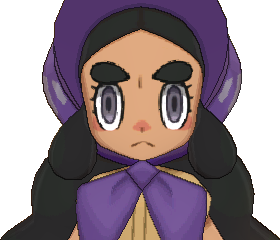 I thought it was cool to finally have a Pokémon game that gives clear and instant access to your next objective in the story, but I don't think it needed to be a character - could've just been a "Journal" or a (personality-less) Pokégear/PokéNav system. I don't like that the Pokédex and Poké-gadget of this generation were merged into one. One major gripe of mine is that Game Freak design a new gadget with every generation, often fulfilling the same purposes. I honestly think it would be cool to see a Pokégear or Pokénav return in a new Pokémon title, with upgraded features for that region. It's weird to me that every single region has it's own version of a phone; if I was to visit Johto from Hoenn, would I be able to call anyone? Are gears/navs compatible? Who knows. For example, the PokéNav Plus in ORAS was a fantastic system, integrating the entirety of XY's PSS as well as a bunch of cool new features. SM/USUM took all of these features and made them.. clunky. And left us with an annoying Rotom dex that essentially over-compensates for the fact that we play as a silent protagonist. So I hope we don't see something quite like that again in gen 8. 3 Weeks Ago (7:05 PM). I think that the Rotom dex was actually a really big logical issue, because shouldn't Rotom have registered itself in the dex? Also, shouldn't it be able to battle and stuff? The same issue persists with ride mons too. Other than that, I really didn't mind the Rotom dex too much, but the Roto lottos and stuff were helpful, but it felt too handholdy. Honestly, I think we should have captured a Rotom and put it in the dex. The way to upgrade the dex would be to level up the Rotom for more abilities. It was a bit annoying though, I'll agree. A wasted opportunity, if you ask me. 3 Weeks Ago (5:30 PM). There were legitimately multiple minutes at a time where I couldn't see the map because he just wouldn't stop talking. If the primary function of the bottom screen is to provide a map and a one-click-away Pokédex, there is a clear issue if a player cannot access said functions because the narrative element associated with the mechanic won't stop running its mechanical mouth. I already barely played the game at all because I was stopped by cutscenes and hand-holding tutorials every 5 or so minutes; I didn't need more tutorials running along the bottom screen. And O-Powers shouldn't have gone away, period. Roto Loto's randomness makes it hard to get the powers you need for post-game (namely the hatching power) and actually forces you to stop playing in order to get the Roto Power. O-Powers were far more seamless, unobtrusive--you the player were in control over what you used and when. Not breaking my immersion when I'm in the middle of taking down the alien threat to humanity by asking me whether I like trades or battles and following it up with a minigame more suited to the now-defunct Game Corner. I definitely appreciate the cleverness of putting the Pokémon known for possessing appliances into a Pokédex, but it was executed incredibly poorly. 3 Weeks Ago (8:36 PM). I feel everyone's dumping on Rotom dex, and yes it's annoying (and I agree with literally every point here), but I still think that it was interesting to have, and sometimes, it was a bit fun. It was pretty entertaining to have someone to talk to, especially when it got too quite. 2 Weeks Ago (11:23 AM). Rotom Pokedex is fun and adorable and I love his comments when you catch a legendary. I don't get what people are complaining about. 1 Week Ago (2:51 PM). Edited 1 Week Ago by ~Z~. 1 Week Ago (4:38 PM). 1 Week Ago (11:35 PM). 1 Week Ago (12:47 AM). The Roto Loto in USUM was useful, but other than that I was never a big fan of the Rotom Pokedex, especially when it kept giving me advice I didn't ask for. Hopefully they'll go back to a normal Pokédex in Gen 8, or at least something better. 6 Days Ago (3:57 PM). 6 Days Ago (6:07 PM). The most annoying thing in SM/USUM, followed by the D-pad issue. The fact that the Dex won't shut up and has to babble every 5 minutes makes me want to break my 3DS. 6 Days Ago (3:59 AM). 3 Days Ago (7:00 PM). I do agree that while the concept was fine, the execution was lacking. It was obtrustive to map functions, as said above you couldn't select the O-Powers you wanted and instead had to get lucky to earn them in a time-wasing slot "game", and its comments at times got repetitive and annoying. It felt like it hadn't been properly playtested, really; a bit of refinement would have made all the difference.